Escape from the every day hustle and bustle of life in your very own beautifully designed garden retreat. Choose from one of our designs or alternatively we will design your perfect cabin specifically for you. In this modern life a garden log cabin can be a welcome addition to any property whether it be for office space, a separate relaxation area or accommodation for visiting friends and relatives. With the unpredictable British weather in mind you can also guarantee that with fully insulated floors and roofs your cabin will be cool in summer and cosy and warm in winter. This very comfortable one bed lodge measuring 14.1mtr x 5.8mtr in produced in 150mm oval logs. Square and Laminated logs available in various sizes to suit you needs. Built as a bed sit home with WC / Shower, Wash Hand Basin the Austin Garden Lodge would be ideal for the students when they return from University, Granny Annex or weekend Guest Chalet. If your looking for a weekend retreat or just somewhere for the visiting relative to stay when there's no space at the Inn, then look no further, we have the answer. 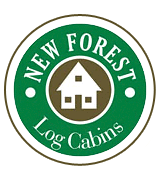 The New Forest Log Chalet..! 1 Bed Log Chalet 5mtr x 5mtr plus overhang and verandah with double glazed windows and doors, insulated roof and floor in 70mm solid Redwood Pine logs. It is not difficult to imagine what use you would put the Sea View Lodge to. It could be a spacious room with a view for holding the Champagne receptions or a quiet place to run your business and even has a mezzanine floor for storage or accommodation, but whatever your needs, this stunning log cabin is big enough to meet the needs of our most discearning clients. 7.5mtr x 4mtr in 70mm square log. The Links was originally designed as a Hotel Room for Golfers, but since then we have re-designed it as a Granny Annex and Holiday Chalet. Built in 70mm Square Log with full insulation and double glazing throughout, it has a spacious lounge with galley style kitchen diner, bathroom and double bedroom.